Heat the oil in a 4-quart saucepan over medium heat. Add the onion and cook for 15 minutes or until well browned and caramelized, stirring often. Remove the onion from the saucepan. Heat the bratwurst and beer in the same saucepan over medium-high heat to a boil. Reduce the heat to medium-low. Cook for 10 minutes, turning the bratwurst over once halfway through the cooking time. Lightly oil the grill rack and heat the grill to medium. Grill the bratwurst for 10 minutes or until cooked through. Place the bratwurst in the rolls. 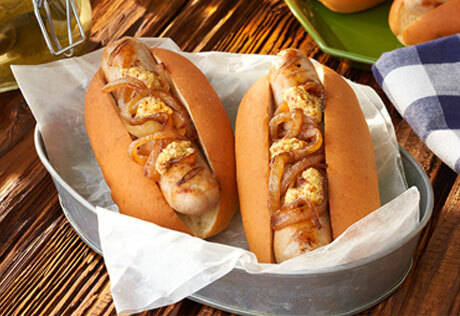 Divide the onion among the bratwurst. Top each with 1 teaspoon mustard.